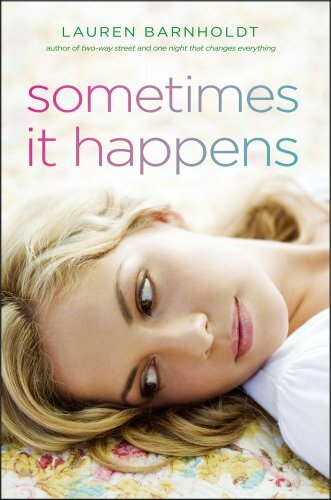 I picked up Sometimes it Happens just to see what Lauren Barnholdt's writing style was, and three hours later I was done with the book. This was my very first novel by Barnholdt, and definitely won't be my last. Especially if she writes all her books the way she did this one. Ava and Hannah are best friends and just finished their sophomore year. After everything that just went down with Hannah and her ex-cheating-boyfriend Sebastian, she is ready to move on and enjoy her summer with her best friend. But then Ava decides to break the news to Hannah that she is going away for the summer and getting a summer job, leaving Hannah behind with Ava's boyfriend Noah. Noah and Hannah get really close over the summer, and I mean REALLY close. Neither one expected it or even thought about it. It just happened between them and it leaves Hannah pretty much in a box of nerves the first day of her senior year. Barnholdt did an excellent job developing Noah and Hannah's relationship. It wasn't an immediate thing that happened, but you can almost feel the chemistry coming off the pages whenever they were together. Their relationship made me laugh, Hannah is such a funny character and was so blind about everything. Noah was obvious, but Hannah never once picked up on his feelings. What she did know was that she just couldn't stop thinking about Noah. I think that Barnholdt also did an excellent job writing this story. She pieced it together perfectly and it wasn't over dramatic or exaggerated. The chapters go from present to past. You learn how everything started between Noah and Hannah, then you jump into the present. Obviously I found nothing wrong with Sometimes It Happens. I opened it just for a peek and then was done. It's definitely a very entertaining story and so fast paced, you can take it to the beach this summer and finish it in one sitting. A must read!